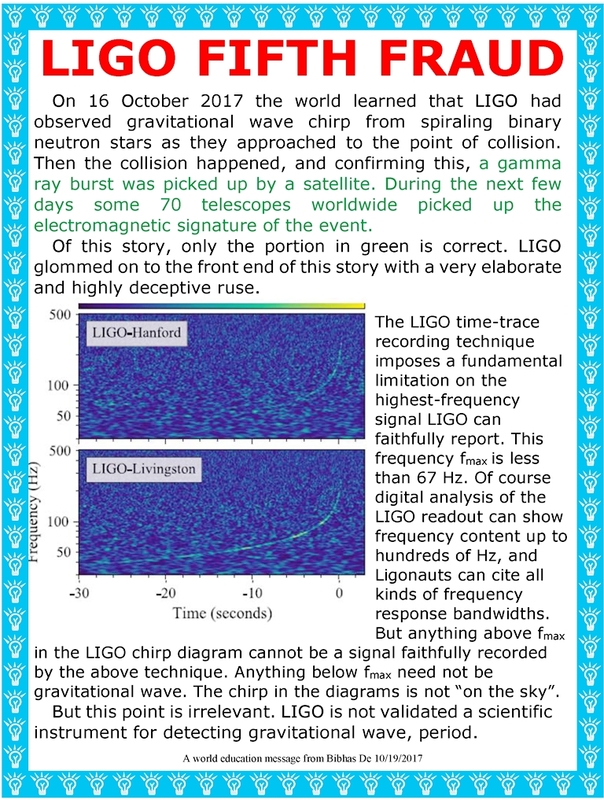 A group of academic scientists from Italy and Brazil has published a paper in a well-regarded, refereed journal – suggesting that the LIGO observation of gravitational wave (GW) from neutron star-neutron star merger (GW 170817) reported in October 2017 is questionable (read here. Full arXiv article may be read here.). They suggest that the event was most likely a White Dwarf-White Dwarf merger, in which case LIGO was not expected to detect a GW signal from this lower energy event. By now a significant amount of dissident literature exists, even if you confine yourself to refereed publications. It is time for all good men to stop listening to the bullcrap from the Ligonauts. They have a haughty answer for every criticism, usually in the form “You do not understand” or “It is too complicated” or “LIGO is highly specialized science.” It is time to attend to the dissident science: clear, straightforward, conventional. Tags: Bogus Physics Nobel Prizes, Covering up science fraud, LIGO gravitational waves, LIGO India, What did they know and when did they know it? This entry was posted on November 29, 2018 at 12:09 pm and is filed under Advancing physics in the Age of Fakery, LIGO Discovery, LIGO India, Physicists play citizens pay, Uncategorized. You can follow any responses to this entry through the RSS 2.0 feed. Both comments and pings are currently closed.